Superbowl Sunday is coming up Feb. 3, 2008, and what better way to celebrate Super Bowl XLII than to serve up football themed cupcakes. Even if your Super Bowl party guests are too busy yelling at the TV screen to appreciate these tiny football fields, at least you’ll have fun making them. What You Need: 1 cupcake (baked and cooled); white icing; icing tinted green; white or off-white icing for piping lines in a pastry bag with round tip (such as #3) OR premade decorator’s icing in a tube OR just snip the corner off a plastic sandwich bag; chocolate Necco wafer or other round or oval brown candy. How to Make It: Frost cupcake using green icing. Pipe 2 white lines parallel to one another. Pipe shorter white line perpendicular to lower line. Pipe “5” and “0” to show the 50 yard line. 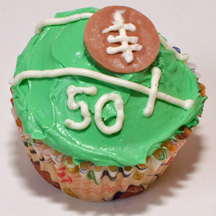 Pipe white “stitching” on candy to make football, and place ball on top of the cupcake. This entry was posted on Sunday, January 13th, 2008 at 4:37 pm	and is filed under sports cupcakes. You can follow any responses to this entry through the RSS 2.0 feed. Responses are currently closed, but you can trackback from your own site.